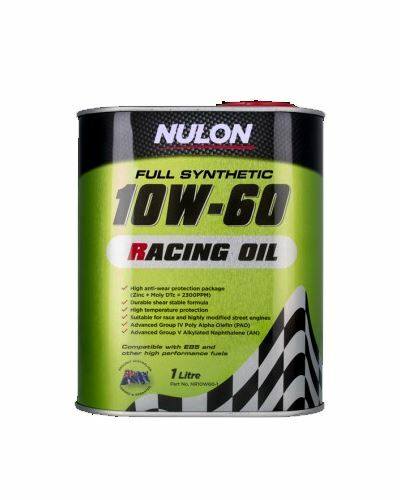 Nulon Full Synthetic 10W-60 Racing Oil is recommended for use in multi-cam, multi-valve, turbocharged, supercharged and large bore naturally aspirated high performance race engines under high stress race conditions. Group IV Poly Alpha Olefin (PAO) and Group V Alkylated Naphthalene (AN) base oils provide fast flowing shear stable protection from cold start up to high operating race temperatures. Nulon Full Synthetic 10W-60 Racing Oil provides enhanced protection for vehicles using E85 and other high performance fuels. 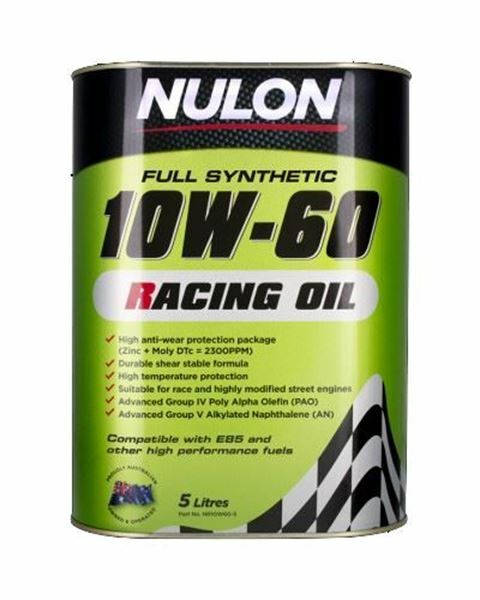 Nulon 10W-60 Racing Oil contains Molybdenum Dithiocarbamate (Moly DTc), which is scientifically proven to dramatically reduce friction, provide increased protection against engine wear and maximise engine power. Shear stable Racing formula for ultimate high temperature stability. Enhanced protection for vehicles using E85 and other high performance fuels.